In the aftermath of the BAND OF GYPSYS, Jimi Hendrix looked to refocus his career and meet the challenges of a new decade. The powerful impact that Jimi's appearances at both Monterey Pop and Woodstock had created had not been lost and Berkeley had developed as a flash point in the heated battle over the Vietnam War and other emerging social and political issues. 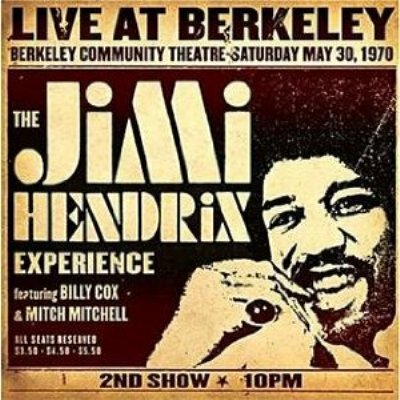 Hendrix had filled the spacious, nearby Oakland Coliseum the previous year and could have easily done so again, but elected for the more intimate theater setting as the venue. All of the available tickets for both shows were quickly snapped up and on the evening of the concerts, more than a thousand empty-handed fans were turned away. Tensions between patrons, venue security, local police, and those without tickets escalated. Ensconced safely backstage, Jimi was unaware of the turbulence that surrounded the building. The sold out house roared it's approval as Jimi and the Experience took the stage. Jimi prefaced the concert with a request he often made of his audience, asking them to forget about yesterday or tomorrow, this is our own little world tonight. The evening's second set is presented here in it's entirety and original sequence.